Rugelach has been an all time favorite snack for years. Stumbling upon a Savuer issue from the fall, I was instantly inspired to explore this new recipe. It hails from a bakery in Budapest called the Cari Mama Bakery. Inside the proprietors roll out all sorts of wonderful Jewish classic dishes. One of rugelach's greatest features is being able to try many different fillings. Chocolate is usually the standard and most appreciated however varieties like apricot, raspberry, and raisin are frequently found. Usually rugelach is flaky, buttery, and light, but this recipe yielded a crunchier texture. All in all it’s easy to follow, produces wonderful aromas, and tastes quite divine. For a quick snack and a simple way to impress your family, make homemade rugelach! Ingredients: 4 tsps. unsalted butter (softened) 4 oz cream cheese softened 1/2 cup sour cream 1 egg 2 3/4 cups flour 1/4 cup confectioners sugar 1/4 tsp. kosher salt 5 tbsp. sugar 1 tbsp. ground cinnamon Filling: your choice! Procedure: Oven at 350 F Dough: 1. Make the dough in a stand mixer using the paddle attachment. Beat the butter and cream cheese. 2. Add the sour cream, egg, and continue to beat till smooth. (You may need to scrape down the sides) 3. Sift the flour and confectioners sugar into the mixer, continue beating on a low speed until the dough forms around the paddle. 4. Divide the dough into 4 balls and wrap each in plastic wrap and let rest for 1 hr in the fridge. Filling: 1. Combine sugar and cinnamon in a bowl and set aside. 2. Working with the dough, roll out one ball at a time into a circle. 3. Spread your filling inside. I picked to use nutella and cinnamon sugar, my mother picked raisins and cinnamon sugar. 4. Using a knife cut the dough into even size wedges. 5. Roll up from wide end to narrow end. 5. 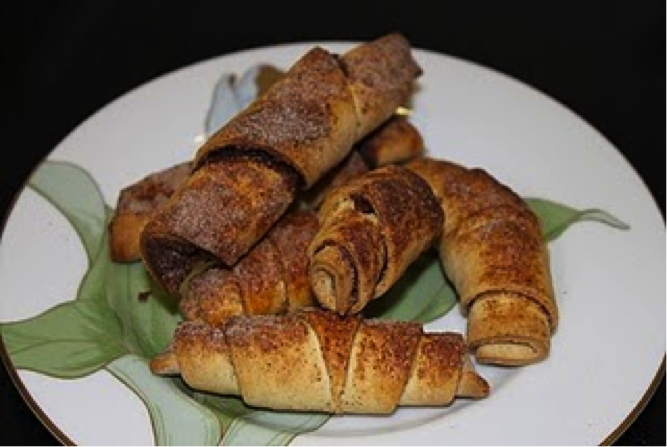 Transfer rugelach to a parchment paper brush the top with an egg wash and sprinkle top with extra cinnamon sugar. 6. Bake for 20 - 25 minutes depending on the oven, and let rest for 5 minutes.